Gift Certificates are available for purchase over the phone and at the front desk for any amount or online in the amounts of $20, $50 and $100. PURCHASE IBY Membership Monthly Recurring: $88 / Mo. *Membership Includes: Unlimited Yoga at both N. Main & VTCRC, 10% off retail, 5% off workshops and 1 Free Guest Per Month* Our Most Popular Membership! We joined United Healthcare’s Wellness & Fitness Reimbursement Program. If you are a United Healthcare Member and you purchase a monthly membership at In Balance Yoga and practice 12 X per month, you will receive $20 reimbursement from UHC. The wellness program that pays you back for getting fit. Register on the Rally website or app and track your attendance. Based on self-reported and digitally captured data, Rally provides engagement through personalized recommendations, rewards, coaching, tools, community and content that promotes healthy lifestyles. Read more about UHC & Rally. Let us know if you have any questions! Save, print and bring the WAIVER FORM into the studio for your first visit. What does the word Kunga on our schedule mean? “Kunga” is a Kinyarwanda word meaning “to serve or help”. In Balance Yoga will give 5% of proceeds from weekly Kunga classes, workshops, teacher trainings, festivals and retreats each quarter to Homes of Hope Orphanage in India, the Farm Sanctuary and Yoga Village. Kunga means the “style” of yoga is Service! The word “Kunga” is used in the title and that the Kunga Theme of the Month is integrated. Class sequence or type of class is the same while incorporating these elements. Join us and help support these organizations and our mission of service! Homes of Hope Orphanage Farm Sanctuary Yoga Village We have two spaces at In Balance Yoga to practice yoga. 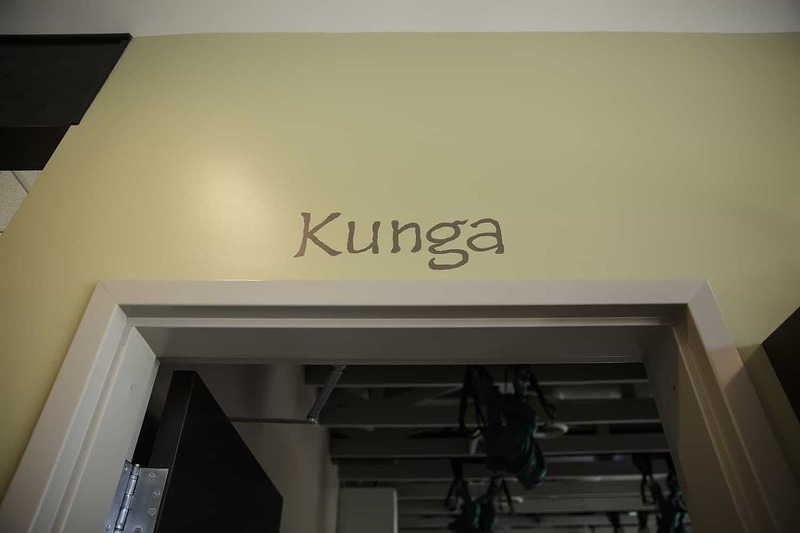 The room located behind the front desk adjacent to the locker rooms is the Karma Room and the room adjacent to the lobby located on the front of the building is called the Kunga Room. In Balance Yoga is the first Kunga Yoga School in the state of Virginia. 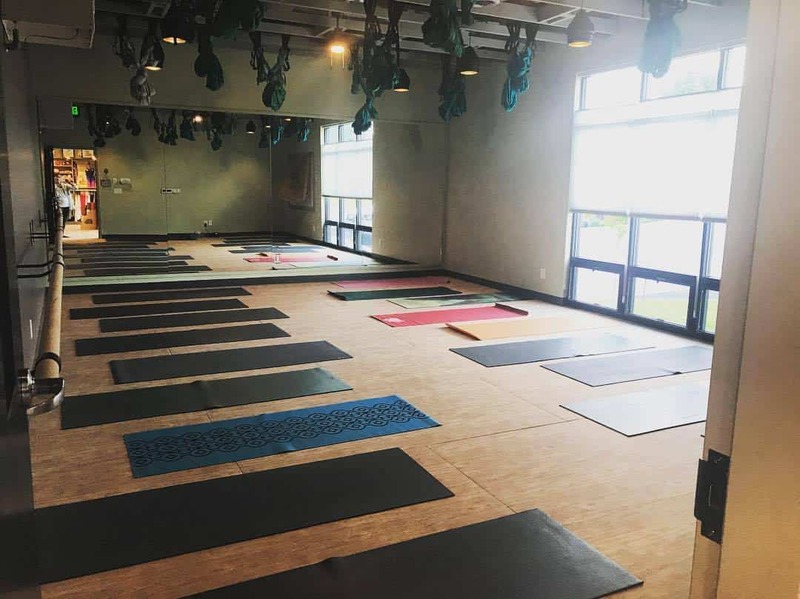 In Balance Yoga is also an affiliate and host studio for the Kunga Yoga School founded by Kristin Cooper-Gulak and currently hosts two 200 Hour Yoga and Lifestyle Teacher Training Programs per year and various Kunga Workshops / 300 Hour Modules. In Balance Yoga has 14 Aerial hammocks with a double attachment point hung from four ceiling steel beams. For students with little to no experience with Aerial Yoga. Learn the basic skills with us! Experience the feel of the hammock, learn proper alignment, and practice safe entry on and off hammock. Introduction to aerial poses, simple flowing sequences & basic inversions. Strengthen upper body muscles and develop core strength. The hammock is suspended at hip height – release chronic tension, experience “lightness” and have a lot of fun! Clothing Requirements: short or long sleeves (no tank tops); no zippers or metal. No jewelry. No yoga mats required. 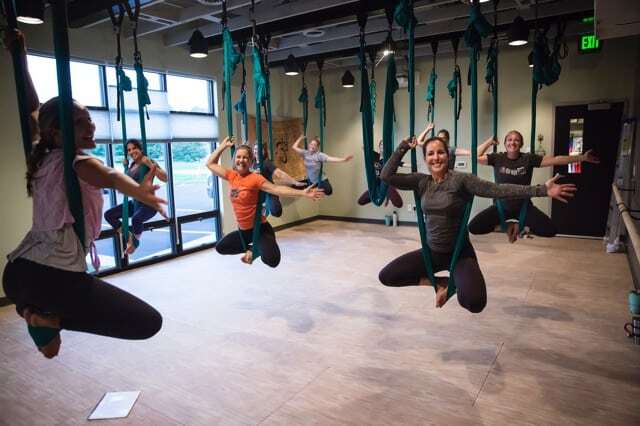 Click Here for More Info on Aerial Yoga Physical Restrictions: Please talk to the instructor before class if you have any concerns. People who have heart disease, high blood pressure, vertigo, eye diseases (such as glaucoma), or are pregnant should consult their doctors first before trying inversions. Alignment Based Slow Flow is a practice filled with playful and explorative movement while in the poses to enhance inner space and presence. Fun and empowering class that will tone & strengthen your body! Focus on flexibility and alignment. Includes upper body exercises using light hand weights. Ballet, Pilates, yoga & dance-inspired moves throughout class will build muscular strength: “cardio” bursts will get your heart rate up. A perfect complement to yoga – builds stability & tones. Come ready to work and have fun! This class is 50 minutes. Basic Flow classes have a varied sequence. This class is open to all levels: especially for new students, seniors, students experiencing injury, or those wanting to slow down and “fine tune” their practice. Accessible to any and all body types. Posture, meditation, and movement are slowly introduced. Learn alignment and simple breathing techniques. Use props to support your poses. Feel comfortable in the foundational postures that are offered. Prenatal Friendly. We slow our practice down–doing fewer poses but holding them for longer. Expect a moving meditation incorporating traditional poses and breath. This class is open to all levels. Formerly called Hatha Yoga on our schedule. “Community” class means that there is no charge to attend. We are offering this class to our community for no charge. Community classes are open to all levels and are usually taught by our In Balance Yoga Teacher Training recent graduates. The type of class varies. “Donations” class means that there is no charge to attend however donations accepted to support the listed organization. In Balance Yoga donates 100% of proceeds to the organization being featured. Donations classes are open to all levels. Contact inbalanceyogastudio@gmail.com if you are interested in setting up a Donations class to support a cause close to your heart and serve our community and beyond. Guided Meditation lying in Aerial hammocks. Lie still, breathe and let go of all your senses while suspended in midair in our Aerial hammocks. Experience a Guided Meditation using voice techniques, sound and movement. Go on your inner journey. Heal the body from stress, anxiety and any of life’s daily emotions and traumas. Leave the outside world – go within and experience total relaxation and deep healing in your private, peaceful space. No previous meditation experience needed. 14 Aerial hammocks available. Recommend Pre-Registering. Clothing Requirements: short or long sleeves (no tank tops); no zippers or metal. No jewelry. No yoga mats required. Please wear layers (socks, sweater). Body temperature can fluctuate during meditation. Flow classes have a varied sequence. This class is open to all levels: especially for new students, seniors, students experiencing injury, or those wanting to “fine tune” their practice. Accessible to any and all body types. A flowing class linking breath and movement in sequences that work all of the major joints and muscles of the body. Posture, meditation, and movement are introduced. Learn alignment and simple breathing techniques. Use props to support your poses. Feel comfortable in the foundational postures that are offered. Gentle classes have a varied sequence. This class is open to all levels: especially for new students, seniors, students experiencing injury, or those wanting to slow down. Accessible to any and all body types. Posture, meditation, and movement are slowly introduced. Learn alignment and simple breathing techniques. Use props to support your poses. Feel comfortable in the foundational postures that are offered. Class will have slow transitions between standing and floor series to meet each student where they are. Prenatal friendly. Hot Flow classes have a varied sequence heated to 95 degrees with added humidity. Move with us! Classes can be vigorous, powerful and with dynamic movement. Flow through Sun Salutations, creative sequencing, standing postures, balance work, floor series, pranayama and meditation included. Explore deep twists, back bends, inversions and arm balances. Develop endurance, strength, and increase flexibility. Link breath with movement and “flow” with purpose between the postures in enjoyable sequences that work all of the major joints and muscles of the body. Baptiste Power Vinyasa Yoga classes are based on the Baptiste Yoga Methodology and Journey into Power sequence. The room is heated to 95 degrees with added humidity. Link breath with movement and journey through a deliberately constructed series of Sun Salutations, standing postures, deep twists, back bends, inversions and arm balances, as well as hip opening postures. A focus on alignment principles, presented in a clear and concise way, fosters the experience of strength and power associated with physicality, movement, and breath. The physical practice is accessible to all levels with options for modification available in each posture. Music is not played regularly in this class. Occasionally, music is incorporated. Hot 26&2 is a set sequence each class developed by Bikram. Each class offering is consistent. Experience 26 postures and 2 breathing exercises designed to heal and balance the body. This healing tradition comes from Calcutta, India and builds strength, flexibility and endurance. The poses are static and held to deepen the experience of each posture. Practice stillness between the poses, encouraging concentration and meditation. Please come to class hydrated and bring a towel and bottle of water. Hot Flow – Set is a set sequence each class developed by Jimmy Barkan – Barkan Method of Hot Yoga. Each class offering is consistent. A beginner-friendly series of postures practiced in a heated room in order to warm the muscles and joints for a safer, deeper stretch while working the internal organs to release toxins. This healing tradition comes from Calcutta, India and builds strength, flexibility and endurance. Please come to class hydrated and bring a towel and bottle of water. Class begins with standing deep breathing, Sun Salutations moving into a static standing series and closes with a floor series. Hot Flow 2 – Set is a set sequence each class developed by Jimmy Barkan – Barkan 5 Vinyasa. Each class offering is consistent. This class begins with standing deep breathing, has five dynamic flows with double chatarungas (high plank to low plank), standing static postures and then a floor series. We recommend practicing Hot Flow – Set before attending Hot Flow 2 – Set. Please come to class hydrated and bring a towel and bottle of water. Breathe, bend & bond with your toddler! A fun-loving, supportive, and active yoga practice filled with dozens of Itsy Bitsy Yoga® poses designed just for your toddler. At a time when children naturally explore movement, Itsy Bitsy Yoga® builds confidence in their moving bodies, and encourages their creative spirit both in and out of class. This class is 50 minutes. Kundalini Yoga is an blend of spiritual and physical practices that incorporates movement, dynamic breath, meditation and mantra. Each class uses specific breath techniques and focuses on the movements of the spine to help open and release stuck energies. Create repetitive kriyas (movements or gestures) to build strength, stamina and physical vitality. Practice stillness for ease, clarity, and to increase consciousness. The kundalini philosophy is based on the 7 chakras or energy points located along the spine. Each week will have a rotating teacher leading students through a guided meditation. Practice breath work, visualization, sound, imagery, observation, deep relaxation and other techniques to feel more deeply connected to yourself and to others and improve concentration. Reduce stress and calm the nervous system. This class is 50 minutes. Experience a dynamic mat-based class focusing on strengthening core muscles, improving flexibility, and performing body weight exercises that challenge and tone the entire body. The class often uses hand weights, resistance bands and other props to challenge clients of all levels. No pilates experience is required and modifications can be provided. Each class is different but all classes incorporate the 5 basic principles of STOTT Pilates. This class is 50 minutes. Power Flow classes have a varied sequence. Move with us! Flow through Sun Salutations, standing postures, balance work, and floor poses. Explore deep twists, back bends, inversions and arm balances. A rigorous flow practice offered during the lunch break with bodyweight training exercises; focusing on strength training, cardiovascular endurance and flexibility. This class is 50 minutes. Power Flow + Weights is a set sequence each class developed by the NuPower Method inspired by Baptiste Power Flow with weight training. Keep your bones strong and healthy, increase muscle tone and flexibility, and improve your cardiovascular health with three cardio bursts in the sequence. The weights used in class are called NuBells – circular hand weights which allow balanced muscular action; ergonomic. Each class offers a power flow, weight training, core and glute work. You can choose between 2.5 lbs, 5 lbs, or 7.5 lbs weights. Class is set to a fun playlist – get toned with us! This class is 50 minutes. Appropriate for all trimesters, the class combines stretching, strengthening, and relaxation techniques to provide relief from common discomforts of pregnancy and to assist in preparation for labor and birth. No experience with yoga needed prior to pregnancy. Reserved for pregnant women only. Restorative Yoga uses props to support the body in a sequence of poses that moves the spine in all directions. Typically we “restore” for five minutes in each pose. It is a practice of “undoing” and deep, conscious relaxation including meditation and pranayama (breathing exercises). With the body at ease, we can use the breath as a tool to help the mind become still. This class is for anyone seeking deep release & total relaxation. Unlike a regular aerial class that places the hammock at hip height, the hammock is around 12 inches off of the ground. The low hammock offers greater support and deeper relief of tension in key areas: hips, shoulders, and low back. Class consists of 4-6 poses held in extremely supported ways for longer duration. The extended time in each posture allows the instructor to personalize the practice to each student, assisting them in use of the props, adjustment of body position, and gentle massage to encourage total relaxation. Blocks & bolsters are used to increase the ability of students to find gradual opening without strain. Students are guided through meditation and soft breathing techniques. Boost the immune system and quiet the nervous system to reduce stress in the body, mind, and spirit. This class is a unique blend of Eastern and Western practices, fusing a fixed gentle yoga flow with healing modalities such as Reiki, I.E.T., meditation, breath-work, crystals, aromatherapy, Shamanic practices and sound therapy. 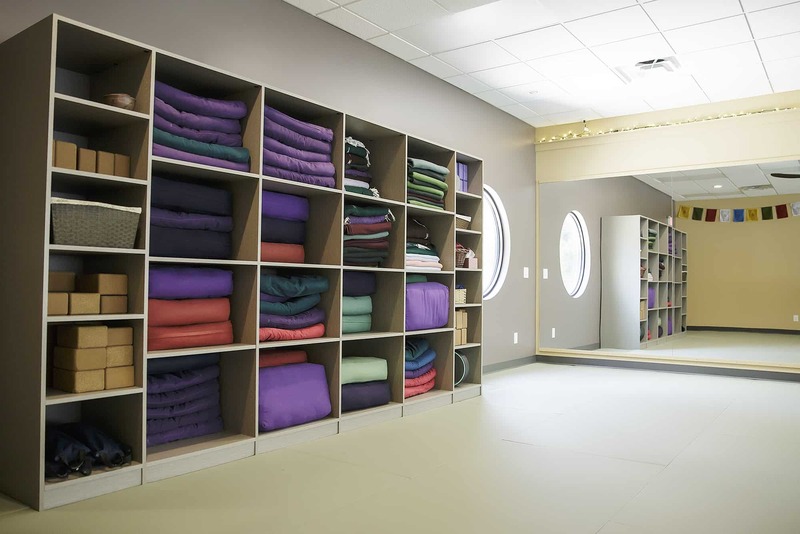 It is designed to help the individual more readily absorb the benefits of the practice in a profoundly healing environment. This offering is perfect for those looking to achieve an overall sense of well being, who desire to connect to their True Nature which is naturally joyful, peaceful and loving, but has also been shown to be of great benefit to those dealing with anxiety, depression, addiction, insomnia, PTSD, stress, injury, illness and mobility issues. This uniquely experiential class is launching here at In Balance Yoga! Treat yourself to this offering as you begin your journey to wellness healing your body, mind and spirit. Warm Flow classes have a varied sequence heated between 88-92 degrees. Move with us! Flow through Sun Salutations, standing postures, balance work, and floor poses. Explore deep twists, back bends, inversions and arm balances. Develop endurance, strength, and increase flexibility. Link breath with movement and “flow” smoothly between the postures in enjoyable sequences that work all of the major joints and muscles of the body. Yoga Basics classes have a varied sequence. This class is open to all levels: especially for new students, seniors, students experiencing injury, or those wanting to slow down and “fine tune” their practice. Accessible to any and all body types as well as all experience levels. Posture, meditation, and movement are slowly introduced. Learn alignment and simple breathing techniques. Use props to support your poses and receive total benefit of each pose. Feel comfortable in the foundational postures that are offered. Yin Yoga is a practice that brings balance to active bodies and calms the mind using passively held floor poses (deep stretching for typically 3 minutes per pose). 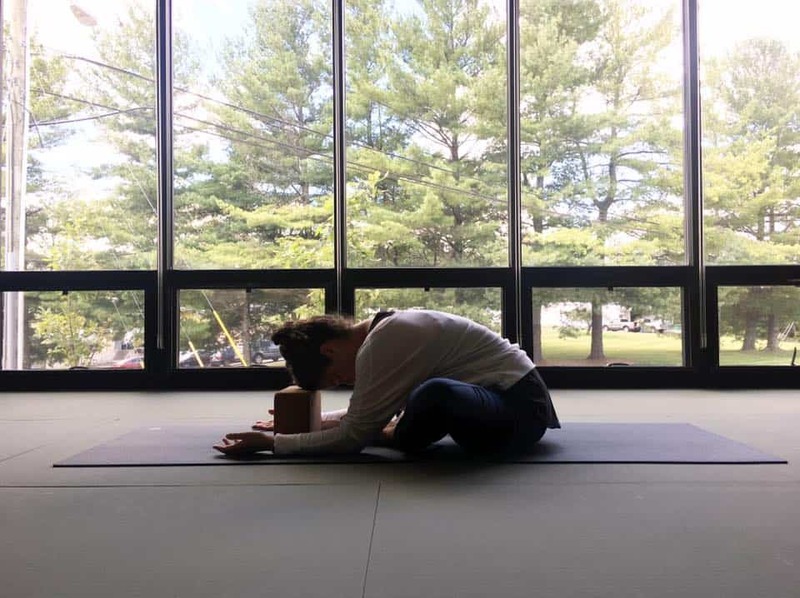 With Yin, the connective tissues that form our joints are gently stretched and rehabilitated, increasing flexibility and nourishing the meridians, the energy pathways that flow through the body. Appropriate for all levels of yoga experience.